LA JOLLA—If 95 percent of your neighbors are chatty and outgoing, you probably know more about them than the 5 percent who are reclusive and shy. It’s similar for neuroscientists who study the striatum, a brain region associated with action control and learning: they know a lot more about the 95 percent of neurons that communicate with outside regions than the 5 percent that communicate only within the striatum. Green dots across top third of image indicate neurons in cortex, a brain region outside the striatum that nonetheless directs information to PV interneurons in striatum; scattered green dots in middle third indicate striatal PV neurons; large vertical green-yellow crescent near bottom right indicates thalamic reticular nucleus (TRN), shown in current study to connect to striatal PV neurons. PV interneurons are thought to integrate sensorimotor information for action control and learning. Salk Institute scientists mapped where information to the 5 percent is coming from and, in the process, clarified the relationship of two types of neurons to psychiatric and sensory/movement disorders, respectively. The different communication pathways these two types of “interneurons” represent may offer new drug targets for disorders as diverse as Parkinson’s, OCD, depression and autism. The work appeared in the journal eLife on May 1, 2018. The two interneuron types studied, ChAT and PV, comprise less than 2 percent of the total neurons in the striatum. What little is known about their function in the striatum comes from postmortem studies of human brain tissue. Compared to healthy brain tissue, samples from patients with depression and schizophrenia show decreases in ChAT interneurons, while samples from people with movement disorders such as Huntington’s disease, Tourette syndrome and dystonia show reductions in PV interneurons. But with so few of each type in the brain, traditional techniques such as monitoring the activity of brain cells couldn’t yield sufficient data to confirm the exact function of these interneurons. So Jin’s lab took a more global approach. 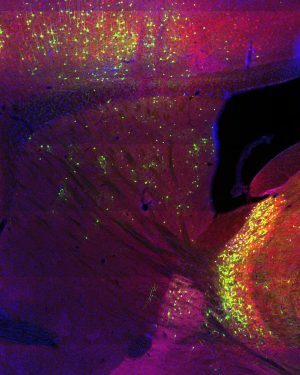 They used a technique pioneered by fellow Salk scientist Edward Callaway to harness a modified rabies virus tagged with a fluorescent marker to track which brain cells were communicating with each other in mice. In doing so, the Salk team discovered several interesting things: first, that communication signals to the ChAT neurons came primarily from areas of the brain responsible for cognitive functions; and, second, that input to the PV neurons came mainly from sensorimotor areas. Together, these bolstered the clinical observations in human patients and implied their different roles in cognitive versus sensorimotor function. In addition, the team discovered a novel connection no one observed before: a cluster of neurons called the thalamic reticular nucleus (TRN) that project directly to the striatum. This was surprising because the TRN was thought to be limited in its projections to the brain region for which it is named, the thalamus. Because the TRN result was so unexpected, Jin and first author Jason Klug next sought to verify their initial rabies result with two independent methods: optogenetics, which uses light to stimulate neurons to fire, and electrophysiology, which records electrical activity. While causing neurons in the TRN to fire, the researchers recorded whether PV interneurons in the striatum responded. The neurons did, which validated the evidence for TRN-striatal communication. “The combination of techniques was crucial to this finding and allowed us to explore undiscovered or underappreciated inputs to striatal neurons. We employed rabies tracing to screen the anatomical inputs, and used electrophysiology and optogenetics to verify the functional connectivity,” says Klug, who is a research associate at Salk. The lab’s work will continue to define the functions of ChAT and PV interneurons in controlling behavior, and to investigate them as potential targets for treating psychiatric and neurological diseases. Other authors included Max D. Engelhardt, Cara N. Cadman, Hao Li, Jared B. Smith, Sarah Ayala, Elora W. Williams and Hilary Hoffman of Salk. The work was funded by the National Institutes of Health (R01NS083815 and R01AG047669), the Dana Foundation, the Ellison Medical Foundation and the Whitehall Foundation. Jason R. Klug, Max D. Engelhardt, Cara N. Cadman, Hao Li, Jared B. Smith, Sarah Ayala, Elora W. Williams, Hilary Hoffman and Xin Jin.